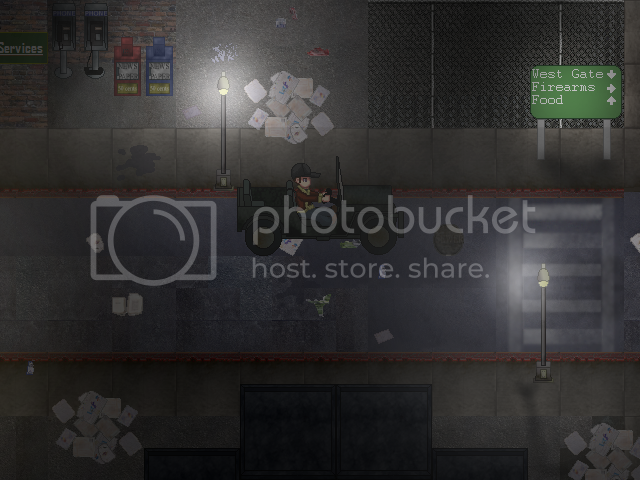 A zombie survival game with a splash of rpg systems. The game no longer takes place where zombies completely rule the world, but the world is in deep trouble. The game will now take place few weeks after the dead have first rose. The first "safe haven" you start off in is an office building with the staircase destroyed with roof access. The dead have been walking for about 5 weeks already. You are in the building with a few other people, and you can save other people from outside to bring back to the building. You can do diffrent missions for all the main characters, then leads to you leaving the city (main storyline mission) once it gets too filled with zombies. Doing missions other than the main one will be rewarding, but its a risk you have to take. You don't have to do missions the whole time however. You could just leave the building on your own and go out and kill zombies and explore. I want to game to have choices that will affect the way the story goes, but nothing too deep. Quick ideas of areas I want to make. All areas will be accessable by highway/freeway. You will be able to either chose to drive on the highway yourself, or "quicktrip" once you have found that location. Quicktrip will teleport you to your selected area. Not magiclly, what really happens is it skips the trip and makes it so one of the survivors drove. I don't want hours of aimlessness, it will have signs of how to get where you are going. You will also have a roadmap to look at. However, driving yourself will sometimes let you find extra items and weapons. Such as maybe you will run into a police car with a new gun inside it. Or catch a new survivor that can help you. If you don't keep an eye on them and you bring them back to your hideout, they could zombify and attack. When someone gets infected, shoot them. Not everyone will agree on your decision too though. Keep in mind, you cant make everyone happy all the time. But it is good to keep your "trust/approval" stats up. Ok so lets go into a little more detail about the main characters. Please bare with me it's still kind of bare. I will be posting the sprites as they finish so yeah. Arnold is the muscle of the main 3 characters. He is more of an act before thinking type of person. Although is decent at stealth, he rather do things his way. Shooting anything that moves from the start to finish. Not your average "dumb muscle" but lacks making complex plans. He is often corrected by Kelsey, who is the brains of the operation. Can be a sarcastic prick but it's all for laughs for his satire style sense of humor. Has a taste for cheap cigars. Barely any battle expirience and doesn't really know how to use a firearm. She much rather have the boys carry out the dirty work. But without her brains the team would have possibly been killed long ago. She is usually the one they can rely on for the best course of action and how to approach the situations they have been handed. An excellent sense of navigation and a pro at electronics. Don't be mistaken by her looks though, she is strong minded and knows how to stick up for herself. A young teen saved by Johnny on the first day of the outbreak. James rather run that stay and fight. Although cannot contribute much towards the fighting aspect, he has a decent ammount of knowledge cooking from classes he took before everything changed. Is often joked apon by the team for his deep interest in conspiracy theories. Although confused from all that's going on, his heart is in the right place. Will help the team with whatever he can. A young man in his mid 20's. Always tries to look towards the bright side of things and help people in their time of need. Even if it means getting into trouble in the process. A "believer" simply put. Basic knowledge in firearms and hand to hand combat. While not the leader of the group, puts in his share just as everyone does. You will have a large amount of weapons to choose from, as well as variants of these weapons. You can hold up to 4 weapons at a time: a Primary weapon, a secondary weapon, a support weapon, a melee weapon, and your fist. All these weapons will be able to be upgraded and customized. You will be able to use attachments such as extended magazines, grenade launchers, suppressors, flashlights, scopes, LAM's, ect. The headshot system will rely on a number of things. 1) the accuracy stats of the weapon you are using. 2) Your level up stats of the weapon you are using. 3) The actions you are doing while firing. For example, if you walk while shooting, the headshot chances will go decrease. But standing still and shooting, it will make it easier to get a headshot. But ducking and shooting, will have more of a chance than the previous two. Stronger weapons such as the desert eagle, will make zombies head explode when you recieve that headshot. This is simply for strafing or locking your hero in one direction while you move making it easier to hit your target. Weapons will be available to buy at the gun shops in the safe city, stolen from destroyed cities, or found off dead enemies. You can use a "RENT" option were you can use one weapon for half price, but only on one mission.Headshots can be achieved, but the chance of getting on depends on a few things. Moving while firing makes less a chance to score a headshot. Secondly, the type of weapon you are using as well as the amount of skill/stats you have with that weapon. For example, you would have a better chance of getting a headshot with a bolt action rifle than a handgun. By upgrading your Stamina (which can be done by walking rather than using vehicles) you will be able to run for longer before getting tired and do more damage with melee attacks. You will also be able to escape from Zombie Grapples much easier, your health bar will grow larger when you level, and it will take few more bites to be infected. If you use a weapon for a certain amount of time you will level up and get better with it. This will mean you can get headshots easier with it from being used to the way it "handles". and reloading it will take less time as well as you will be able to draw your weapon quicker. Trust determines your chances of recruiting new people. If you do bad things like killing innocent people and not keeping promises, it will go down. Do enough bad things and survivors in other cities will hear about it and not trust you. There will be an infection percentage each time you get bitten. Depending oh how bad the zombie wounds you the more the percentage will go up. Once the percent reachers 100, you will die, and reanimate as a zombie. .You canâ€™t do missions while you are a zombie, but you can play as one just for fun. The game will automatically save on every map you enter (unless youâ€™re a zombie) so you can easily reload from where you messed up. Battle mode will be mostly a 2-player feature. In Battle Mode, you can do one of three things. One is Survival mode in which you kill as many zombies as you can before the time runs out. Another is Co-op mode which allows you to play through small missions with objectives with a friend. Finally, there is Brawl Mode. In Brawl mode you go up against another player while fighting off zombies. In this game, you can drive vehicles that have managed to survive the chaos. Such as jeeps mounted machine guns on the rear that you will be able to use, and if you run out of ammo, you can always just mowâ€™ em down by running them over! With this system, you will be able to take any empty building and convert it into your own, personal fortress. You can barricade the doors and windows with anything you happen to find, but be prepared â€“ Zombies will never give up if there is food inside. You will also be able to set traps. You can also sleep in your safehouse. Sleeping will refill your stanima gauge. However be sure to eliminate zombies that make their way in. Even if they are on a lower level and cant reach you, your sleep will be disturbed and you wont gain as much stanima as you would regulary. Food is just used to refill your health. A minigame mode parodying the game Left 4 Dead. It will feature 2 characters to choose from, running zombies, lots of ammo to go around, and a few maps to play through. So the first cutscene is finally almost complete. This is the safehouse which is Johnnys studio apartment. The entrances are barricaded. I am fully aware of the bed map error and a few things on this chipset is just place holders. This one Johnny is awoken by suprise by Kelsey. Since the zombies have been walking around for a few weeks now, he is very suprised when kelsey wakes him up so he quickly aims his weapon at her only to relise it is her. Kelsey lets Johnny know that the supplies are low, and he must meet the team up the stairs heading to the roof to plan it out. 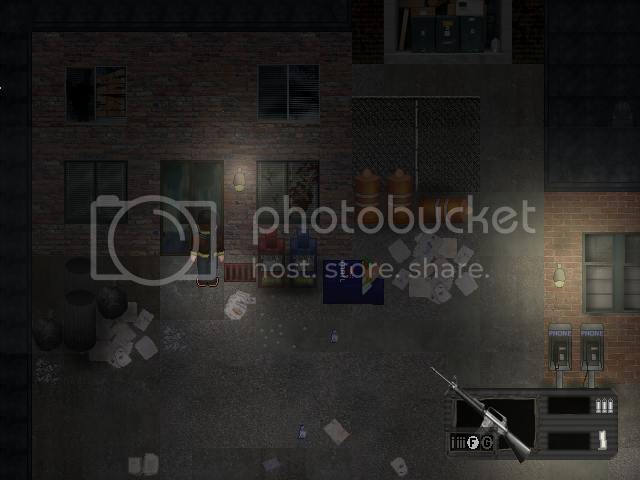 This is after Johnny gets dressed, you must grab your weapon then head to the roof for the first mission. Which is a simple supply run. -Plenty of houses, stores, and apartments to go inside of. Fall of the Living will stay true to the George A. Romero zombie formula. Slow, but dangerous when surrounded by a large number. This game will not feature mutants, or any kind of deformed creatures (other than zombie dogs). Its a zombie outbreak, similar to the original Dawn of the Dead. Zombies are not your only concern. You must battle with the evilest creature on the face of the planet: human beings. Riots wage throughout the city, looters will try to take whatever they like. Prisoners have escaped from their cells, people are confused about if they can trust. Some zombies will have special respawns. Such as one may break through the door exiting a house. Or a car will swerve onto the map crashing into a nearby wall, and a zombie will fall out. Or a rebel or looter you have once killed will respawn as a zombie. This system is already completed and I while it is very simple, i feel very accomplished because it feels very fluid. This looks fantastic, can't wait to see the final project. Also moving to RMXP Projects due to the amount of screenshots and apparent completion this has done. Oh wow. This I have to see finished. It's pure eye-candy. wow, this looks absolutely amazing. best of luck, I cant' wait to see this. The gameplay system is almost fully complete. Finally after 2 years of coding it! Now I am focusing on building the actual game like maps, cutscenes, boss fights ect. The story is coming along the way I wanted it too. I also have an original music composer working on the pieces for diffrent parts of the game. An open beta will be made available soon after I finish atleast 2 missions. While this is a zombie survival game, alot of this has to do with encountering human enemies as well. The zombies are dangerous, but they are a more "in the way" sort of deal. Heres the way the zombie AI works. -When you enter a map you are unnoticed by any of them. One thing I hate in games is when the enemy always knows where you are no matter what. -If a zombie spots you you enter the alert phase. In Alert phase only a small mob of the zombies close to you will begin to come after you. -When you attack a zombie, you enter the battle phase. The music changes and enemies further away on the map will get suspicous from the noise. -Zombies will also get suspicous if you fire your gun without a silencer in an area. They will also have objects on perticular maps that if you run into, the hero will kick them by accident and cause noise, making zombies that are close to you suspicous. I'm working on a stealth system that allows you to sneak through the shadows unnoticed using terrain tags. The darker the shadow, the harder it will be for the enemies to spot you. But you dont have to sneak. If you rather run and gun, or simply try to outrun them to get to your location, you are free to do so. But lets say you are low on health or ammo, stealth would be a wise choice. If you start attacking enemies and stay in one area for a while just shooting them, the map will respawn even more zombies to come after you and even more aggressive. I finished up the zombie attacking behaviors as well. -Zombies walk slow, but when you are in alert phase and are close to a zombie, they get violent and rush forward to grab you. -Zombies will randomly either grab you or attack you with their fist. -When zombies grab you, you have a certain amount of time to press the enter button a certain ammount of times before he bites you (decreasing health and adding chance of infection). If you press the enter button the right amount of times the hero will push the zombie back, causing the others behind him to stumble as well. -Like in the movies, when surrounded by a LARGE horde chances are slim you will survive. Sorry for the long post! Just wanted to explain what I been working on! Holy crap, its about time someone made more of an action game with RMXP. Can't wait for the demo, man. Yeah, this looks great. Good luck! This looks good. Good luck! Thanks guys! The cutscenes are going faster than I thought, as well as the progress for voice actors, character sets, mapping and such. Speaking of voice actors. If you didn't notice Arnold is supposed to be an exact Schwarzenegger copy. And I finally found the perfect Arnie voice actor that agreed to play as him! Is this guy great or what! Being excited about the new VA I decided to make him look more like Schwarzenegger. Haha, the VA's pretty good and the new sprite is pretty awesome too. I wish you the best of luck with this. Whoa. This looks sweet, ChainsawMelody. Wow, this looks absolutely amazing, cannot wait to see this finished. The worlds ends on 21/12/12, where will you be? I am making a game just like this, but i was just wondering where u got the kaiser tilesets from. Please get back. I don't see what cigs or drugs have to do with SURVIVING but to each their own I suppose. Yah dood, ciggs n druggs wud make dis gaem 10000000/10. Wow, looks really cool. Good luck on it! I like the character animations you posted,good stuff. Cigs and drugs would make the game seem more realistic. They could be either useless items or they could have a use e.g Cigs make you more accurate by calming you down but lower your health slightly and Drugs could decrease your accuracy slightly but gives you an elevated damage resistance and melee damage for a bit (just watch out for the addiction). You get the idea. Otherwise your game looks really good. Keep up the good work. just seems to me like saying "it worked in Fallout 3, so it should work here too!" It should work here. It works almost everywhere. For me, drugs didn't work in Fallout 3. It refills a gauge that doesn't really need refilling. It's a dumb idea. He didn't put it in, so it's not in. The game doesn't lack anything for not having drugs. What a stupid argument.